This trick is an old one, but a good one. Both designers of equipment make users happy with it. I found it even in a digital tester called AT1000 by Amplitrex. Don't be misguided by nice scales with fine stripes, on a big meter pretending to do a magnificent job. It means nothing. Look at this picture, for some basic understanding of how meter scales work. This is actually very interesting, and when I did my studies, during lab hours we were taught understanding of the difference between what you initially 'think' you read, and what it is guaranteed to be said by the meter. Some delicate fooling of the user is done by many instruments. Here is something elementary of all readings: When you get presented by a meter the number '3', it means sure not 2,9999 or 3,0001. What is does mean, the measured value was closer to 3 then to 2 and really the number '3' means no more than that. If the real value is closer to 2, the meter is defective. So a '3' t means it might as well have been 3,499 and so the resulting number is '3'. We can do an exercise with these identical thermometers at the left. In the middle is what we call the 'system' it is the blue bar which moves. The numbers are the scale. So there is the system and the scale. Now two things make the meter not ideal. First, the system has the specified measurement error, and the scale has a reading error. These meters are two out of the same production batch, and they are measuring the same temperature, and each of them is not defective and can be sold as good working. As you can see it's pretty useless to show such fine stripes when the system accuracy is not very good anyway. Looking at the left scale, you can read 27.1 and the right scale 28.2. So a scale like 25 - 26 - 27 - 28 (etc.) would have been more better. Then you would say: Left is 27 and Right is 28, and then actually both meters are considered 'good' because one step in the last digit is allowed. (This is a general rule, and then we say the meters read the same, because the readings overlap). However as in the picture, the left meter suggest 27.1 which at it's highest is 27.2. The right meter suggests 28.2 which at it's lowest is 28.1, and the very fine hair stripes suggest more precision as the system has. Now this is not illegal, but if fools the unexperienced user. Even worse if there is no precision indication on the meter, you may assume the finest scale stripe is valid. In that case, there is no overlap and the only conclusion is: One of the two meters is defective. As long as you have only one meter, you feel happy with the 'precision'. Another way to make this clear, is the following, suppose both meters had no finer divisions, so only 10 - 20 - 30 etc. Then each meter would read 'just below 30'. Which is true for both of them. And then again both are not defective. So if the accuracy of the system (the blue bar) is low, you can not make it better with very fine divisions, and the instrument maker should not do so. This is the elementary way of true accuracy interpretation in engineering. So a correct meter, can have low accuracy, but it should present you a scale with without fine divisions and then it's ok. This actually has become a general disease with all tube testers, and make good note they are usually fooling you. So I put this issue up front here. So no extremely fine scale stripes should be penciled on a 15% accordance tester. Excuse me, but most Hickoks are a negative example for that. Conclusion: There is no point in making the scale higher resolution that the inner system. In a way, you are doing the same, when you over-calibrate a tube tester, which is sometimes difficult to explain why this is not working well. Meters like the later Hickoks use ultra thin hair stripes with a much finer resolution that the whole tester can ever have. The meter shown here is not even so bad, there are much worse examples. You read something 'very' precise from a fine scale, dividing the 1500 Mmho range in steps of 25Mmho. (this is so crazy.... 25Mmho on a 5% error tester). So the difference is indicated between 1475 and 1500 Mmho. This can never be so because the whole tester had 5% deviation at it's best when it was new. (At this scale 5% is 75 Mmho). Well and some are even 15% and they use the same meter. Did they know this at Hickok? Well of course they did! The older Hickoks like I-177 do not suggest a higher accuracy as it actually has. You can read the Gm scale only very roughly, which more represents what the tester is actually doing. And nooo... If you think now the I-177 is imprecise, you missed the point. It has the same precision as any other tester. Just be aware that the later models with the very fine hair stripes are sometimes just 15% precision testers, and you can't change that by adding more fine hair stripes suggesting 2% resolution. The early AVO Mk1 has the 'very fine scale' trick also, they really were overdoing that. With the later models Mk2...4, CT160, the designers at AVO have come with their feet back on the ground. With CT160 which is the most precise of all AVO's, the lower scale has numbers like 20-40-60-80-100 and divides the range from 80....100 only with five stripes. This is true honesty, because indeed by no means the whole tester can't do any better than that. The mega Ohm scale jumps from 10Meg to 25Meg. It just tells you in between you can estimate the number yourself, but the tester can not, which is true. All it will tell you the resistance is in between 10 and 25 Megs, and if closer to the one or to the other number. Keep in mind measuring 25 Mega Ohms is not easy without electronics. However at lower resistance it gets better, being able to measure with 50x more accuracy (200k) . Mmm still a lot of deviation. Is that meter not good? Oh yes it is! It tells the truth about the measurement. So when I measure 5250 Mmho with accuracy of 500Mmho, I believe this. I love my CT160. When I measure 5250 Mmho in a Hickok with a suggested meter precision of 25Mmho, that 25Mmho resolution is bullsh.... I don't believe it at all. I never use a Hickok for precision measurements, but it must be said the red-green scale works perfect, perhaps the best of all testers. When talking about accuracy, the red/green scale had only 'red', 'green' and 'white' in-between. Well fair enough, and that's what you're getting. As you can understand I wanted to know how good the accuracy of the W19 is, because I had fully restored it. Very much information about it you will find on the main page, including a full restoration report, and meter calibration. Just as a fun project, I re-build this one to the best accuracy I could get. The little digital meter you see here, is just for the pictures, but it happens to be a good one. 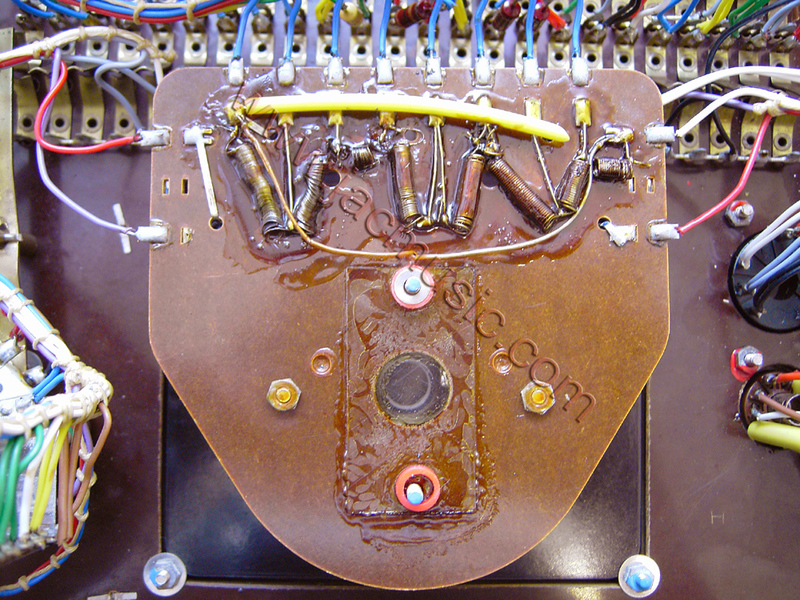 Actual restoration has been done with a new Agilent digital meter, which is not on the picture. Very well done with the Funke is the voltmeter option, since that very quickly tells you something about the panel meter (after all those years). Note old panel meters often show a few % less, due to the magnet loosing it's magnetization. With all old tube testers, you have to begin with calibrating the meter, and get readings + impedance back to what it should be. This is a rock-solid, feet on the ground, correct and honest tester. Well worth the +1000 Euro price they go for. Actually the one I have is now amazingly precise, and when I first saw the wooden inside construction, I did not expect this. I will explain in this text, where this precision results from, but it is mainly the well calibrated panel meter, and the very precise voltage stabilizer tube GR150-DA. So when you read 10mA it means 10.0 and not 10.1 with this tester. I do not know if all W19 were originally that precise when they were made 50 years ago, but mine is in this condition at least today. Try to change meter readings attempting to correct other errors. So the standard work at the beginning of a repair is always remove the meter and test it separately on the bench. This is the meter with the cover plate removed. You can see the ladder network for the current ranges. In the middle you the the hole through which the stabilizer tube lights through. This is a problem with almost every tube tester. Also W19 has too high voltage with tubes that draw very little current. 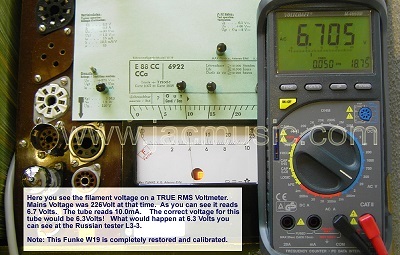 You see here a TRUE RMS Voltmeter, and it measures 6.7 Volts heater voltage instead of 6.3 Volt, when testing an ECC88 tube. The heater voltage of this tester can not be adjusted, so it is one winding for 60mA heaters, and 3Ampere heaters as well. When it gives 6.3 Volts at 3Ampere, then 'only' an increase to 6.7 Volts at very small current is not even bad. This is a good transformer. The problem with this however, weak tubes tend to give significant better readings at already 6% higher filament voltage as here. The effect is even more with DHT tubes. So an older DHT tube may easily read 10% better than it is. As long as you know this, you know what you're doing, but... there is a very elegant way to correct this. For this, please read the following part about mains voltage. A much bigger error with heater voltage comes from leaving the mains voltage tap to 220V as it was done in 1950 and forget about it ever since. But we have 230V already since decades already now. So to save the whole tester, I set it OF COURSE to 240V. This drops the heater voltage accordingly, and with my W19 I took this choice, so to make sure the smaller tubes are tested with more accurate heater voltage. Beware for any tested to be 'good' tubes on Ebay, with a W19, because changes somebody has still set the internal tap to 220V is the highest. Most users do not even know this makes a difference. A better way, would be to add a small 230V to 10V / 1Ampere transformer inside. The 10V winding is then serialized with the 230V mains, making it 240V. The the tester at it's 240V setting is then connected to this new created 240V. 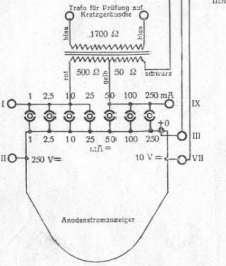 Principle is the same as an auto transformer. So output power of this is 240Watt which is enough. I might do this one day. 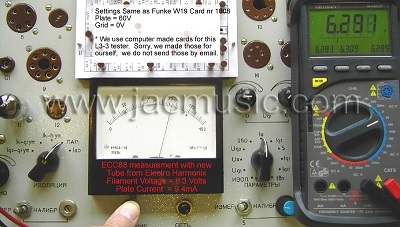 In the next picture, we repeat the Funke W19S measurement with the same ECC88, on a more versatile tester, the Russian L3-3. With the L3-3, you can perform any test you like, so imitating a W19 is very easy. We just set it the same as the Funke W19 card Nr 1088, which is for the ECC88, including the TOO HIGH filament voltage of 6.7V the W19S uses. The result is really as expected. You can see both testers show the same number: 10.0 mA very precise. At least this gives a very good feeling about the good function of each, and the good calibration. Let's go back now to the fact that we tested the tube at too high filament voltage of 6,7V. Look at the next picture, and we will re-test the same tube, but this time at the correct filament voltage of 6.3 Volts. You see this makes a certain difference. 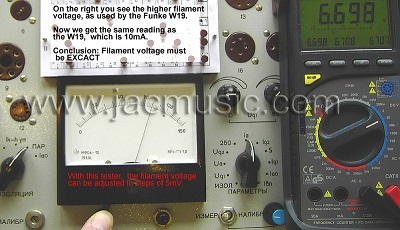 This tube measured 10mA on the Funke W19. When this test was repeated on the L3-3, with the correct filament voltage for this tube, it measured 9.5 mA instead of 10mA. So I do want to say, the current measurement and anode voltage is awfully precise, but differences with heater voltage compromise the result. This is however the same problem with almost every tube tester. The ones I know that do not have this error, are AVO VCM 163, and the Russian Kalibr Tester L3. How important is 5%? Here is one way to find that out. Go to a supermarket, and pay 19 Euro for 20 Euro of goods. Tell the cashier, 5% is not unimportant, and just walk out.